White Cross School › Eight-Tracks, Rotary Phones…and Printed Books? Eight-Tracks, Rotary Phones…and Printed Books? The big five publishing houses are being pretty tight-lipped on the subject, so maybe agents do have a reason to be concerned: according to Publisher’s Weekly, authors can no longer assume that signing a standard publishing contract will guarantee a print format edition of their book. In the past, a print version was considered standard, but agents are finding that more and more frequently publishers are refusing to commit to publishing a title in paperback, much less hardcover. The article speculates that such a shift would hurt midlist authors and those below—especially first-time authors and those without consistently strong sales records. Agents fear a new business standard would mean less money for both themselves and their clients and allow publishers to use an e-book only release as a way to “dump” those books they’re less excited about. Which is bad news not only for authors and their representation, but brick-and-mortar bookstores as well. This was written by charles. Posted on Tuesday, November 5, 2013, at 7:22 am. Filed under Uncategorized. 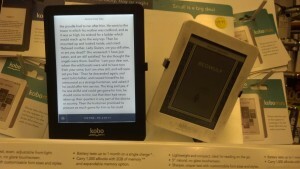 Tagged e-book sales, e-books, kobo, publishers weekly. Bookmark the permalink. Follow comments here with the RSS feed. Both comments and trackbacks are currently closed.